As director Terry Gilliam (The Fisher King, Brazil) says in his introduction of his movie The Imaginarium of Dr. Parnassus, this is perhaps his “the most mature movie I’ve ever made and the most juvenile.” He explains that in approaching this film, he just wanted to have fun, and fun is what he came up with. Imaginarium is a kaleidescope of Gilliam-esque fantastical images and sequences, but they’re all grounded in a simple story about a man trying to save his daughter from the devil. Christopher Plummer plays the man, with Lily Cole as his daughter and Tom Waits as the tempting devil. You can see the influence from Gilliam’s past films, with a great tribute to Monty Python in the form of singing policemen in fishnet stockings. Gilliam’s beautiful imaginarium scenes are stunning on Blu-ray, sharp and clear with colors that pop. The real-life scenes are a bit more filtered, but that’s by choice of the director not the transfer. These scenes still show gorgeous blacks and detail. And the audio is outstanding, bringing us fully into the world. 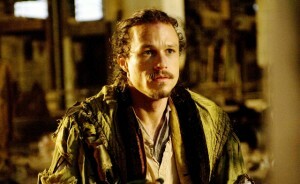 Of course, what Imaginarium will be best known for is the untimely death of star Heath Ledger during production. It almost derailed the film, but, as Gilliam explains in a Disc Dish interview, the support of Ledger’s friends and an idea of how to change the movie helped the film get completed. Consequently, Ledger’s role is also played by Johnny Depp, Jude Law and Colin Farrell. The device used to explain the changes in appearance work in the context of the film, so future audiences who aren’t aware of the movie’s history shouldn’t see anything special, even though today’s audiences will be in-the-know. The Blu-ray comes with a bunch of special features, many also on the DVD, such as Gilliam’s introduction and commentary, a deleted scene that’s a bit long, the interesting behind-the-scenes featurettes “Behind the Mirror” about the film’s production and “Building the Monastery” about the design and construction of one of the most intricate scenes of the movie, Ledger’s wardrobe test and an interview with the late star. Only on the Blu-ray, though, is a multi-angle look at the drunk scene and the featurettes “The Imaginarium of Terry Gilliam,” which explores the director’s work, and “Heath Ledger and Friends,” in which cast and crew members remember the actor. It’s obvious that Ledger’s passing affected these people deeply, and, as Gilliam points out, it’s wonderful that the usual Film By credit for the movie was changed (despite contractual obligations, Gilliam says) to “A Film From Heath Ledger and his Friends.” We welcome it.